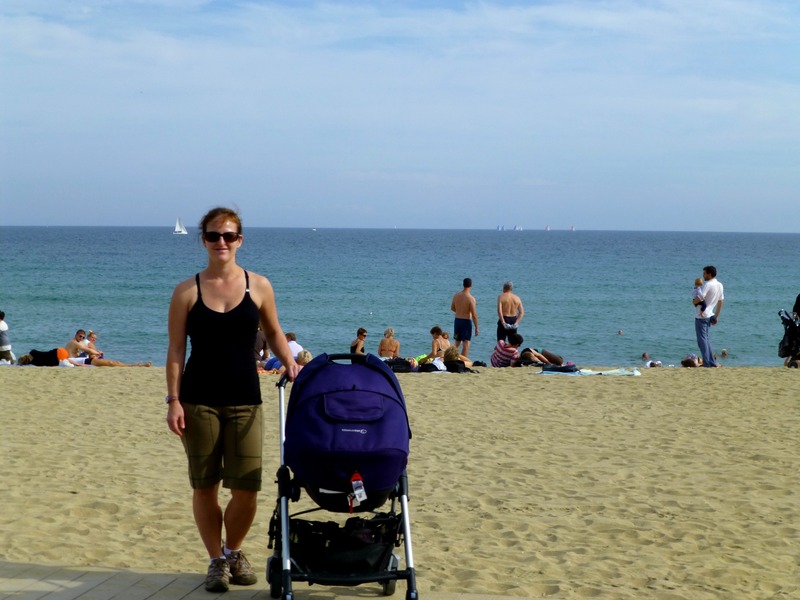 We were pleasantly surprised to find Barcelona so baby friendly. 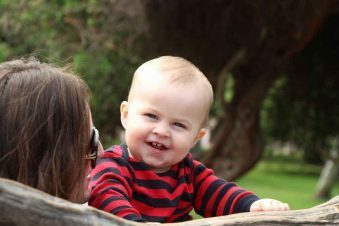 They may not have high chairs at the restaurants and the locals eat much later than we are accustomed to, but to us baby friendly means that we feel comfortable bringing our baby everywhere we go. Our daughter was welcomed everywhere we went in Barcelona and attracted a lot of attention from the locals. 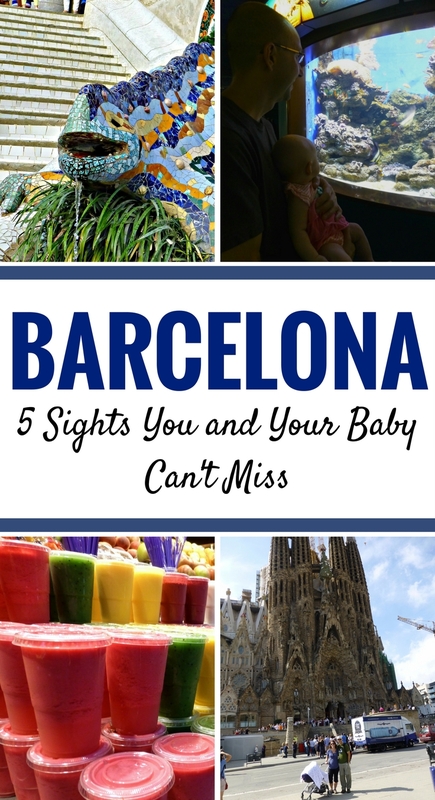 Though she was only 3 months old at the time of our trip, it was obvious to us what a great family destination Barcelona is. Barcelona’s #1 tourist attraction! 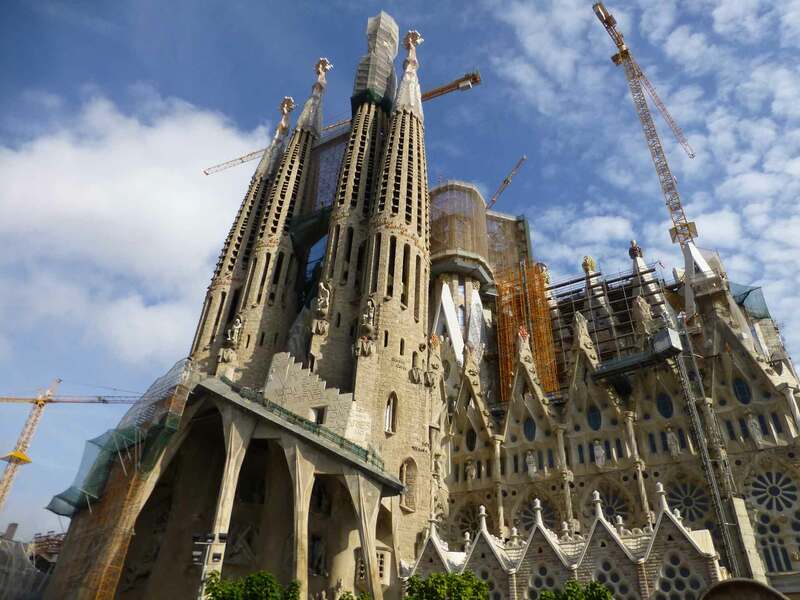 This Roman Catholic Basilica, designed by Antoni Gaudi, originally began construction in 1882, and is still under construction to this day! La Sagrada Família has been declared a UNESCO World Heritage site. Not all areas of this church are accessible for strollers. In addition, it is so busy inside that it can be difficult to maneuver at times. If you prefer to bring a stroller, be prepared to visit only the main areas of the church. There is a nice little park across the street (to the southwest of the church) called Plaça de la Sagrada Família which has many park benches lined up under a row of trees. Not only is it a good spot to feed your baby, it offers interesting views of the church from a little further back. La Sagrada Família offers a lot of visual stimulation for your baby. The huge walls of brightly colored stained glass, the pillars designed to replicate the feel of being in a forest, the intricate sculptures and facades. Assuming they are old enough to notice such details, they will enjoy this place. La Sagrada Família is a must see! It took us approximately 25 minutes to walk there from our hotel. Our advance research highlighted the benefits of buying tickets online ahead of time. Our hotel had a computer station which made it easy to buy and print out the tickets. We were so glad we bought our tickets online as the ‘online ticket’ line was 10-15 people long, where the other line had hundreds of people and wait times of over an hour! We basically walked right in with no wait. Upon arrival we took some time before entering to take some pictures of the exterior. Then we went across the street to Plaça de la Sagrada Família to feed our baby and take a restroom break before entering. Once inside we took her out of the stroller and put her in the wrap to let her look around and people watch. We didn’t have much trouble pushing the stroller around. The official website states: “To enter the building visitors will be required to dress with decorum”. This means no bare shoulders, knees or feet. In addition to being a good place to breastfeed, Plaça de la Sagrada Família also has public washrooms. “La Sagrada Família” (by Sagrada Família) is an Android app developed by the Construction Board of the Basilica of La Sagrada Família which gives users a virtual tour of the interior. “Sagrada Família” (by Musmon Coom S.L.) is an iOS and Android app designed to give visitors to the Basilica a 65 minute audio guide. “Sagrada Família Visitor Guide” (by eTips) is an iOS app that is a 100% offline mobile guide. 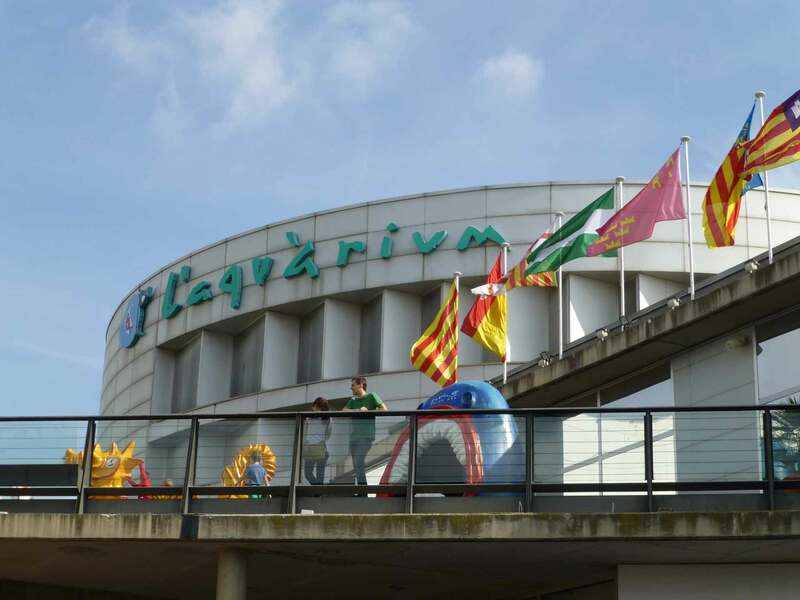 Barcelona’s waterfront aquarium is the largest Mediterranean-themed aquarium in the world. 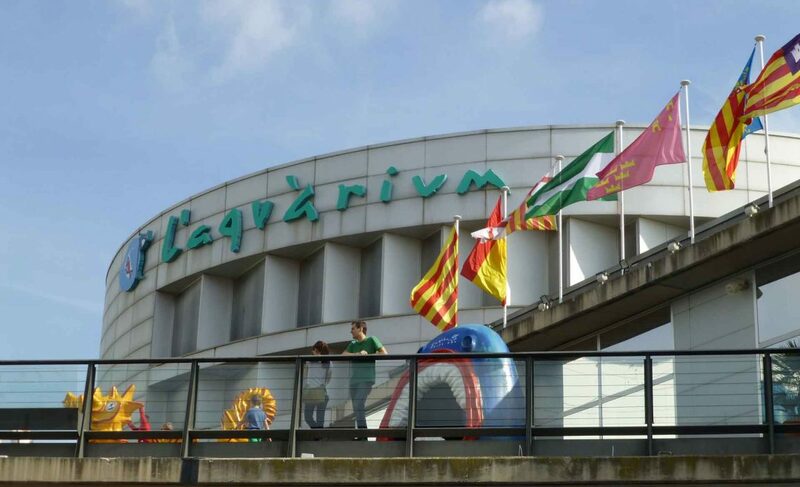 L’Aquàrium Barcelona is a very family friendly attraction which was clearly designed with young families in mind. Visitors are led through the aquarium on a set pathway which is very wide. Ramps have been provided to allow parents with strollers to get from one level to another. Every area within the aquarium can be reached by stroller. There are many park benches surrounding the aquarium complex, many of which overlook the water. This part of the peninsula is not very busy so you will have a good degree of privacy here. This could be the nicest view you’ve ever had while breastfeeding! L’Aquàrium will be an interesting attraction for your baby. Your baby will be able to watch hundreds of fish of all shapes, sizes and colors swim by. There is something about the motion of fish swimming that babies find very interesting. 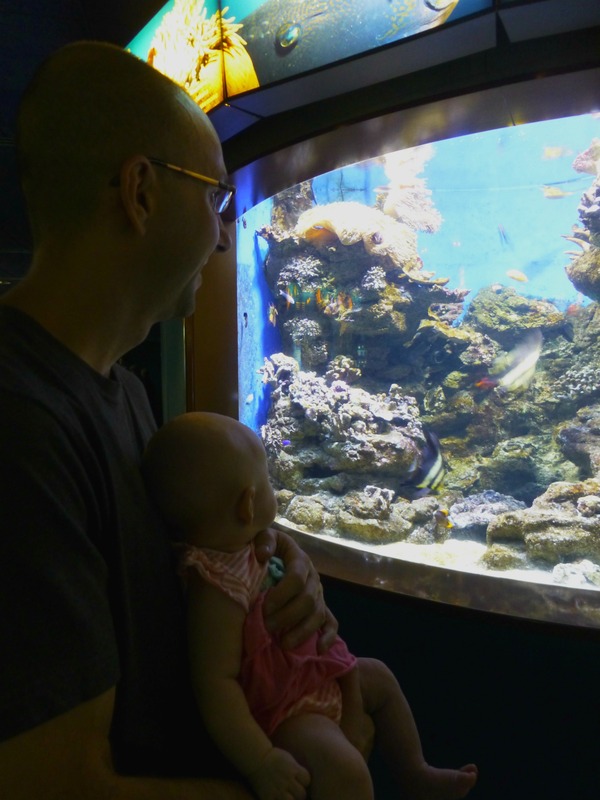 Being a family focused attraction, your baby will also enjoy looking at all the other babies and small children who are also enjoying the aquarium. With wide pathways and many children around, this is one of the few attractions which your baby may walk a little (if they are able) and you won’t have to worry about them breaking anything. We arrived at L’Aquàrium after an enjoyable walk down La Rambla to the waterfront. It was a hot day, so we found a nice quiet spot on the stairs leading up to the aquarium to stop and breastfeed our daughter. It was a perfect spot – far enough away from the aquarium entrance to be private, it overlooked the water, it was in the shade and had a nice breeze. Once inside the aquarium, our daughter loved it. At three months old she was just starting to become aware of the things around her and she loved watching the fish swim by. We will never forget the look of fascination on her face as she saw the very first fish tank up close. Logistically the aquarium was very stroller friendly, although we didn’t have her in the stroller much as we kept her in our wrap so she could look at all the colorful fish. Bring a wrap or a carrier so you can carry your baby outside the stroller. They will love watching the schools of multicolored fish swim by. National Geographic Traveller magazine once named Barcelona as the #1 beach city in the world. Barceloneta Beach is popular for its beauty and proximity to Barcelona’s main attractions. The waterfront has a wonderful paved pathway which runs behind the beach parallel to the Mediterranean. This pathway makes the beach very stroller friendly. There are park benches all along the waterfront promenade, although you shouldn’t expect much privacy here. Alternately, you can visit Parc de la Barceloneta which is on the northern end of the beach or there is a cluster of seafood restaurants in the La Barceloneta neighbourhood where you could feed your baby while eating some paella! If your baby is old enough to sit up and be in the sun, they will love playing in the sand at the beach. Depending on the size of the waves, they may also enjoy playing with you in the water. Regardless of your baby’s capabilities, there is always something going on at the beach – kids building sandcastles, people playing beach volleyball, etc. and as such, there will be plenty of people watching for your little one to do. Don’t want to risk taking your stroller on the plane? 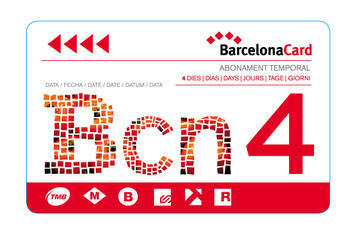 Rent one from Barcelona Turisme! After the aquarium, we put our daughter back in the stroller and headed down by the beach to have some lunch. Based on a recommendation by our hotel, we tried to go to Can Majo for paella, but without a reservation we couldn’t get in so we settled for the place next door. The food was still quite good and we enjoyed a nice view of the Mediterranean Sea. After the excitement and stimulation of the aquarium our daughter was completely exhausted and ready for a nap, so we headed along the beachfront promenade for a nice walk. As she was only three months old, we kept our daughter in the stroller the whole time we were at the beach given our doctor’s advice to keep her out of the sun until she was 6 months old. We could have easily pulled the stroller onto the sand and sat for a while, but we really enjoyed walking on the nice paved pathway which runs along the back of the beach. Had our baby been a little older we would have loved to spend a full day at the beach. Plan to visit other attractions while in Barcelona? 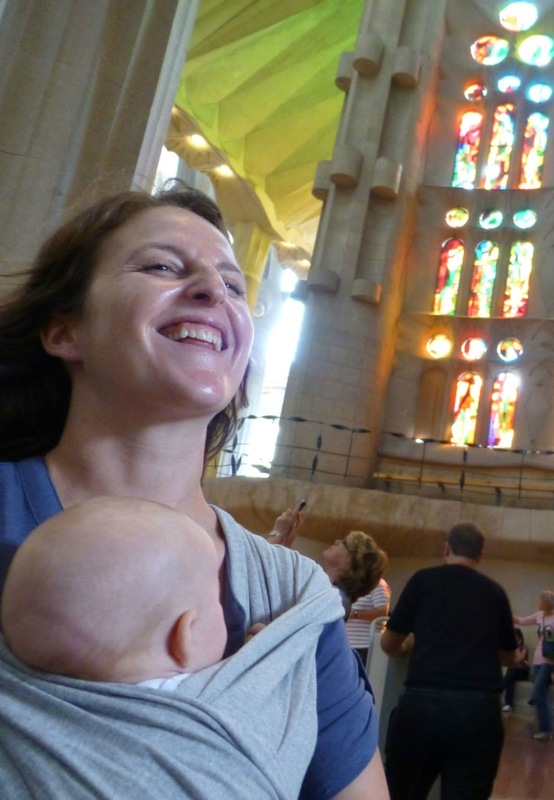 Our Baby Can Travel: Barcelona guide has this same great information for La Rambla, La Pedrera, La Catedral and many more. 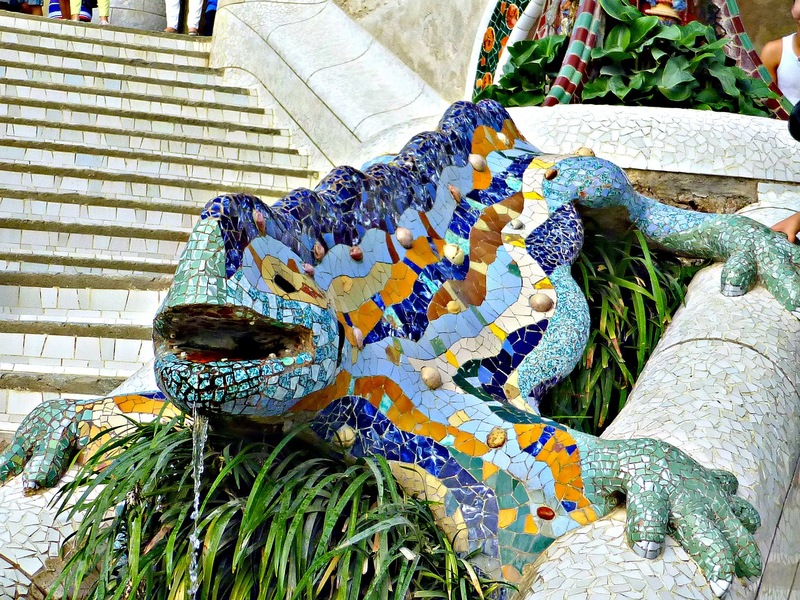 Home of the famous guardian lizard fountain, this park was originally intended to be a residential city garden designed by famous Barcelona architect Antoni Gaudi. The development was a flop and was bought by the city to be turned into a park. Lucky for us! This is one of the most unique parks you will ever visit. Park Güell is a very interesting place with many different areas to explore. Unfortunately, Park Güell is not completely stroller friendly, so if you bring a stroller you will be limited to where you can go. The only paved pathways are the main artery and a few of the paths which lead off the main pathway. If you wish to explore all the areas of the park, you will be better off bringing a wrap or carrier for your baby to this park. There are many park benches within the park, but the park itself is very busy so you may not have a lot of privacy. The majority of visitors to this attraction stay on the main pathways, so try to find a place a little off the main pathway for more privacy. Alternately, there is a quiet little park near the Lesseps subway called Jardins de Menendez y Pelayo on the street named Travessera de Dalt. As with all Antoni Gaudi’s creations, there is lots of visual stimulation for your child. Throughout the park the architecture is very playful, with bright colors, fun patterns and no straight lines to be found. Given how busy this park is, there will be plenty of people watching as well. There may also pathways in the gardens of the park which give your baby an opportunity to walk a little, but be careful as this place gets very busy. We enjoyed our adventure to visit Park Güell, but would have enjoyed it more had we done a little more research up front. Given the park’s distant location, we elected to take the metro to Park Güell. We got off at the Lesseps station and stopped to feed our baby on a park bench in front of the station. The walk to Park Güell from the metro took us about 20 minutes, along a narrow sidewalk then up a long, steep hill. At the end we had to take baby out of the stroller and bring the stroller onto an escalator (which technically was against the rules). Once in the park the stroller worked great, however there was a large part of the park that we could not venture into. There seemed to be some pathways that lead further up the hill that we couldn’t easily access with the stroller as the paths were dirt and had occasional stairs. To get from one area to another, the direct route usually involved a set of stairs, so we often had to take a long pathway around or carry the stroller. Once at the bottom of the park, we took turns watching the baby, while the other parent went to look at some of the more famous and very crowded monuments. Because we were restricted with the stroller, this ended up being a shorter outing than we had planned. We recommend you see this attraction using a baby wrap or carrier. “Park Güell, Official Guide to the Monumental Zone” (by Ajuntament de Barcelona) is an iOS and Android app which gives a complete guided visit to the main points of interest in the park. “Park Güell Tour” (by Storn) is an iOS app which also gives you information about the park as you walk through it. An explosion of colors, smells and tastes, this bustling market offers a great selection of Mediterranean culinary products. It is very easy to get to the market with your stroller. While inside the market you will still be able to go anywhere you want, but it is very crowded and the aisles are very tight. While it is technically possible to bring your stroller here, it isn’t the most enjoyable experience. There is a little park called Jardins del Dr. Fleming on the street called Carrer del Carme about one block west of the market that is an ideal place to breastfeed. There are several park benches in this park, some of which offer a decent amount of privacy. The market is a fun place for infants with so much stimulation for their senses. 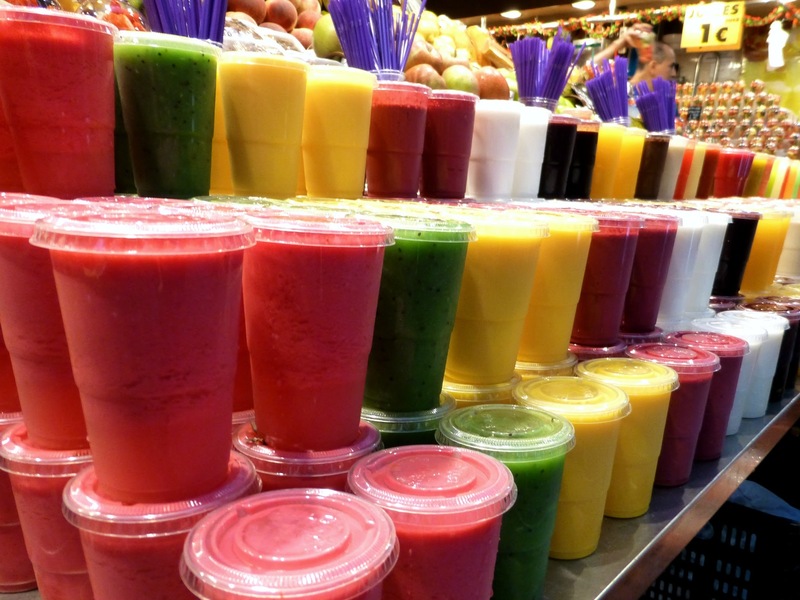 Stall after stall of homemade fruit juices offer a rainbow of colors to look at. The large variety of food vendors all have offerings which smell so good. And people… lots and lots of people to look at. What a great place to broaden their horizons! Well worth the visit if you enjoy markets. Though it was pretty busy, people were polite and made room for us to get by with our stroller. We were so impressed with the food selection here, we promised ourselves to come back and eat lunch here before the end of our trip. We came back a few days later and bought some fruit drinks along with a few empanadas (meat pies). To be honest, we were underwhelmed by our selections – the fruit drink was brightly colored and visually appealing, but it tasted watered down and the empanadas would have been good, had they been warmer. 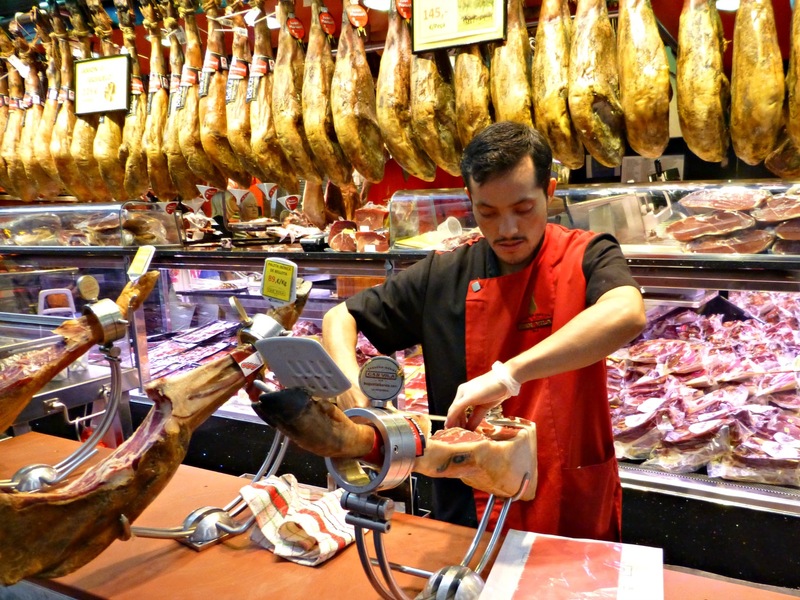 Many vendors within the market sell cured Spanish ham and some are kind enough to offer free samples. NEED A BABY-FRIENDLY PLACE TO STAY IN BARCELONA?